​Identity 101 - Who are you? "Maia is an excellent workshop facilitator. Her workshops incorporates creativity and emotional exploration which helps our clients express themselves in new and important ways. She is very diligent about communicating, brainstorming and providing assistance when needed. I'm glad to have her as part of our team." "Maia's workshop was not what I expected it was so much more, it wasn't just a workshop of handouts but to go within to identify what emotions, beliefs, fears, etc you're holding onto that are causing blocks. The workshop is worth so much more than the fee. Best 3 hours of learning I've had in a long time! Maia Akiva is a great teacher & facilitator." "Maia is as much of a professional business-wise as she is at the profound emotional work she does. Throughout the process of organizing the workshop at The Junction, she was very diligent about communicating, brainstorming and providing innovative marketing material, and laying out and executing all the logistics together. Maia's such a pleasure to work with, and I look forward to working with her again in the future." "Maia leads an illuminating and often surprising workshop that unmasks the culprits of blocks. Her disarming demeanor helps dismantle the walls obstructing creativity and provides the necessary tools for identifying the distractions and resistance standing in the way. She empowers with awareness and creates a safe and supportive environment where everyone learns from themselves and each other." "I was looking for a new way of looking at persistent challenges and obstacles, in hopes of finding a different momentum this year. Both Maia Akiva and the Desire Map were revelations for me. I thought I had a lot of tools to call on to make some positive changes, but I didn't have anything that connected me to the way I felt, or wanted to feel. Maia was a perfect guide to lead me to this new way of thinking. She was able to push and pull, confront gently and provoke powerfully toward greater insights than I was able to get to before. This morning I was thinking about authenticity and fun and it made me smile. Thanks again. " ﻿"I want to be happy, joyous, and free so I decided to attend the Desire map workshop Maia was teaching. But I had a lot of resistance to go and wanted to cancel. My experience was amazing when with Maia help I worked through that and got to my desired feelings. The entire process was very special and insightful and I think I grew a lot as a human. " ​As a writer, a life student and an emotional researcher who dips into every flavor of human behavior and self-discovery using humor, intuition and original visual storytelling, Maia’s specialty is in creating custom-tailored content for groups and organizations. Maia can craft a message specifically to your organization or can tailor an existing program around your theme or work with you to develop a program unique to your group. We are all different after all. Whether it’s about positivity, resistance, breaking blocks, finding happiness or changing perceptions, it's about helping your group go from awareness to actionable solution. It's about turning your group’s stress and pain into peace and joy. Maia designs each custom speaking engagements and workshops to meet your desires and to reinforce the objectives of the entire event. She has the ability to integrate her message into the rest of the event or conference. This means your audience members benefit from content that relates directly to them and reinforces the hard work you’ve done to plan an effective event. ​INDIVIDUAL WORKSHOPS OR A FULL PROGRAM BUILT FOR: RECOVERY CENTERS, Addiction PROGRAMS and Recovery CONFERENCES. Not a therapy session, but a creative and emotional exploration. 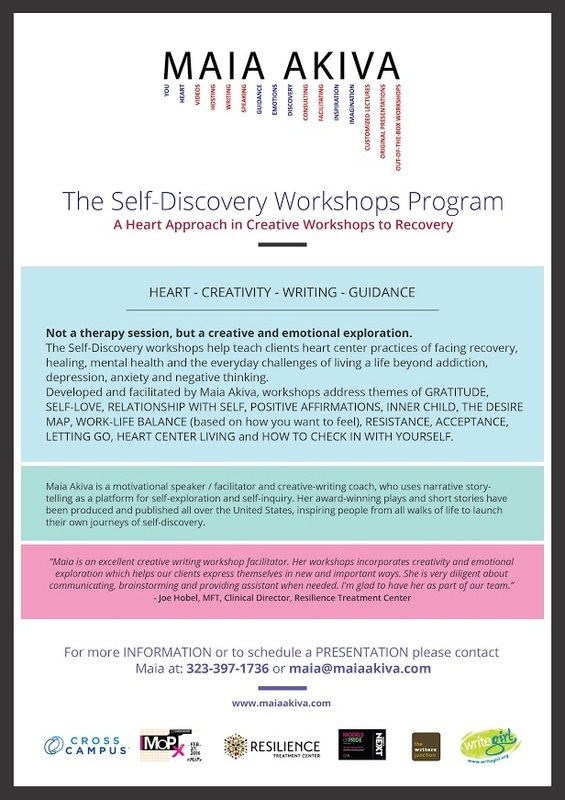 The Self-Discovery workshops help teach clients heart center practices of facing recovery, healing, mental health and the everyday challenges of living a life beyond addiction, depression, anxiety and negative thinking.